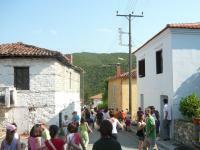 Today, Vrasna is one of the most traditional villages of Strymonikos gulf. Vrasna is part of Municipal District of Vrasna of Agios Georgios municipality. Amphitheatrically manufactured on a green-clad, at the foot of mountain Kerdyllia, Vrasna is the place to enjoy a seducing time travel.This city was used as a temporary base for Spartan's general Vrasidas. He camped here, so his soldiers have a rest, and then followed Via Egnatia on the way to conquer Amfipoli from Athenians. Be Amazed by the traditional Macedonian architecture of the old houses. Visit the folklore museum and view some really old exhibits remains of the traditional way of life and the culture of the village. Pay his respect to the Assumption of the Virgin church witch is dedicated to Saint Georgios. The Fortress complex - "Tripimeni petra"
The country-house named "Syndetirios Egnatia"
The Byzantine Castle right next of the Assumption of The Virgin church. The bell-tower of the Assumption of The Virgin church built there at 1846. The "Moutsara" place, where is located the old water tower of the village. Meet some of the 500 hospitable residents of the village, and understand their daily life thru simple scenes of life. Listen some old local stories and myths from the older residents. Follow all the shows organized with care by the locals, such as the one of the fifteenth of August, the oil feast and the Folk night in Moutsara. Admire the panoramic view of the Strymonikos gulf. Escape to nature, trying mountain-bike or short and long walks of unique beauty. Taste the local cuisine, at the small graphical taverns ordering local meat and cheese. Rest to the traditional guest rooms of the village.